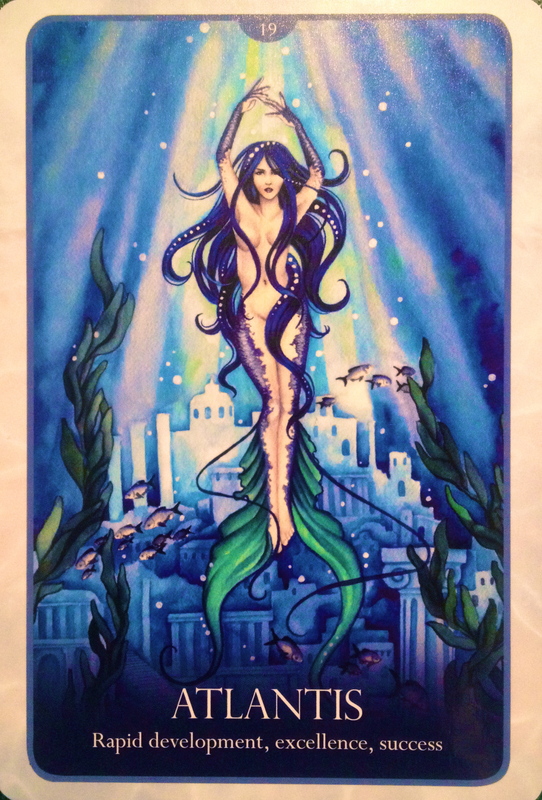 The Mermaids Sing: “We are at a Golden Moment in time… so much is changing so quickly, humans are awakening, the planet at the point of having a time that is at once peaceful and exciting, dynamic and comforting. It can be a time of greatness in your life. But you will need courage. And the desire for “power over” must be shifted tot the “power to.” The more you know you are connected to the divine, that you are the divine, that you are the divine itself, the more you will behave in ways that are divine. When you lose that connection and that belief, when you view yourselves as merely impermanent, meaningless players on a stage, temporary witnesses – then the Golden Time can vanish. Keep the vision alive! It is time to strike that balance between selfless-ness, and the actualized self who is operating out of love, not hubris! OH my gosh, this is soooo my card!! I love everything about it: Atlantis, the mermaid, the message… it’s just so me! Is it you too? I love it, that we are all so connected that we can feel an affinity for something as if it is just for us; yet know it’s also for others. Trusting in the abundance of the Universe is knowing that there is always enough to go around; knowing that the Universe always provides, and that the Law Of Attraction is absolute; you will attract what you vibrate too, and so will others. This card is here to let you know that you are successfully raising your consciousness; even as you are reading this. Even by having an open mind and understanding that Atlantis is and was a very real, special and beautifully peaceful place; it is also a symbol of deep spiritual wisdom and Divine healing connection. Atlantis signifies our innate abilities to heal each other and ourselves; receive and send love; and communicate through the power of our minds. It also signifies that connection to soul provides us with a deep inner wisdom that allows us to see a much broader perspective of our lives in the Universal perspective: the connection to the Earth, to each other and to the Divine. We are capable of so much more, and we are just starting to see the tip of the iceberg. We are powerful and strong in peace and harmony, and our new consciousness is fueled by love. Take some time to meditate today; setting your intention to receive love, light and messages from the Divine. Open yourself to the magic and miracles that await you as you transform yourself. This is it.